Allods Online is a stand out in the free MMORPG genre and is the perfect alternative for World of Warcraft fans looking to cut back on expenses but still play a great MMO on a regular basis. In Allods Online players will explore a number of floating islands (known as Allods) that have been created after a great conflict. This conflict continues to rage between the game factions as they fight for control of particular Allods and their resources. This setting feels very unique and combined with the impressive graphics you’ll get plenty of enjoyment simply from exploration. Allods Online offers all the standard elements you would want in the genre including dungeons, questing, deep skill systems, guilds, character customisation and plenty of PvP. The most unique feature available in the game though are the Astral battles which let players create and battle ships in the magical Astral that separates the floating islands of Allods Online. 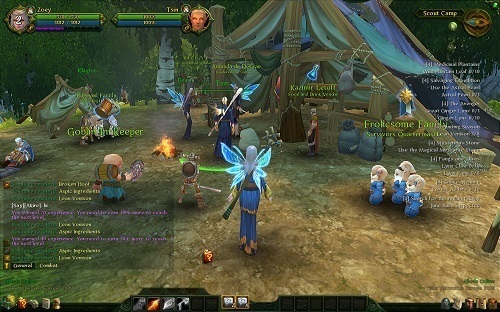 Guilds in particular were definitely a core focus in the development of Allods Online with the variety of guild specific features including a ranking system, special abilities and even unique activities. If you love socialising in a guild atmosphere or running your own guild you’ll find plenty of opportunity and depth in Allods Online. 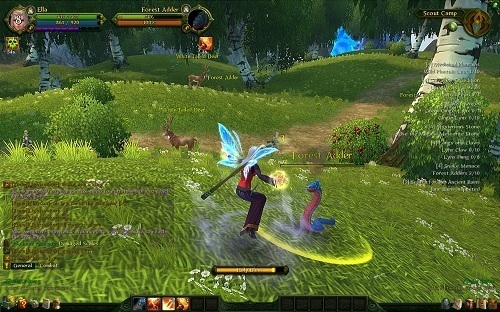 Other notable features of the game that will attract MMO fans include the Astral battles (yes they deserve another mention), a large pool of classes, varied monster designs, a clean interface and a huge number of quests to stop you from having to grind for levels. To top of this great experience you’ll find a cash shop in Allods Online filled with cosmetic options for your character. This definitely isn’t a pay to win game so free players need not worry about feeling disadvantaged. Perfect free World of Warcraft alternative. Access all of the game content for free and only pay for cosmetic options. Focus on guilds and guild participation. Interesting lore and game setting that hasn’t been done before. I realize this post was made a long time ago, the situation has changed somewhat since then, Allods Online is no longer that ‘Perfect F2P alternative’ it once was. Though this may have been true at the time of the post. Allow me to elaborate. This is not true at all anymore, You can pick a wow battle chest up for £10 which includes; World of Warcraft, the Burning Crusade, Wrath of the Lichking, Cataclysm and 30 days of game time. Mists of Pandaria costs £7.99. Total costs to get WoW up and running, including all expansions and a month game time is £17.99 not expensive at all. Allods Online may appear to be free at first look, it’s not until you’ve put a weeks play time into it to reach max level and attempt to compete in end-game-content you’d realize that to even be in with a chance of competing at anything, you’ll need to spend real money. I’m not talking about £10 here and there, I’m talking about £1,000’s to compete at end game properly. Wrong, there simply aren’t enough quests in the game for you to get from 1-60 without having to buy Bonus XP scrolls from the over prices Item Shop. Speaking of grind, I hope that anyone who actually decides to play this game is into the Chinese-style-farm because you’ll be doing a hell of a lot of that at end game to make gold for item upgrades and such like. Again, this isn’t entirely true anymore, yes you can access all of the content for free, however, the Item Shop is filled with items that will give you a distinct advantage over others that are attempting to play F2P, Hope you enjoy being 1/2 Hit in PvP. The worst thing in the Item Shop are the Crystal Chips, used to upgrade a players runes, to a maximum level of 13, you can equip a total of 6 runes, 3 offensive and 3 defensive at level 13, each level 13 runes gives a 43.333% damage increase, 130% if all 3 slots are filled. I’m not sure of the exact costs but it’s well over £3,000 and yes there are a few people who’ve gone to this extreme. This is only 1 of the things that will give an advantage over F2P people. Oh I forgot to mention, there’s this Currency Exchange guy who will exchange the currency you get when you spend £££ to in-game-gold, at the current exchange rate, £10 (1000 Crystals) will get you 54,000 gold. It would take weeks for a F2P player to farm that. – No more Runes. Mob difficulty is adjusted! – No more Cursed items. Exchange your old bag for extra bank storage! The P2P server as a whole is better and a lot more balanced than the F2P server, but because of bad development and marketing, the only active p2P servers are the Russian ones as I understand.